My most anticipated game of 2008 is just about here, literally just a few days away. Today, reviews have been pouring in. So far the online review site Metacitics has a review percentage of 96% and GameRankings.com having a review percentage of 95% which is definitely a great start, considering all the major sites have reviewed the game thus far. GiantBomb (5/5): "Gears of War 2 intelligently builds on the successes of the first game, resulting in an immensely appealing sequel that is better in almost every way." GameSpy (5/5): "Epic's highly anticipated sequel is indeed bigger, better, and more badass than its predecessor." TeamXbox (9.6): "Despite a few minor missteps in the way the story and action play out, and a few forgivable technical blemishes, Gears of War 2 is about as close as you can get to the perfect gaming package. Now the waiting begins for 3." IGN (9.5): "If you haven’t figured it out by now, Gears of War 2 is what’s going tosell Xbox 360s this holiday season. It has non-stop action, freshgameplay, varied environments, an engrossing storyline, multiplayerthat will have people busy for years to come, and some of the nastiestand coolest kills I’ve seen in a videogame." GameTrailers.com (9.5): "It's not absolutely perfect, it's fairly similar to the first game, andit can be boiled down to a simple war game about killing aliens. ButGears of War 2 delivers on all its promises and accomplishes almosteverything a big sequel should--keeping its distinct identity whilebuffing up in every possible category." 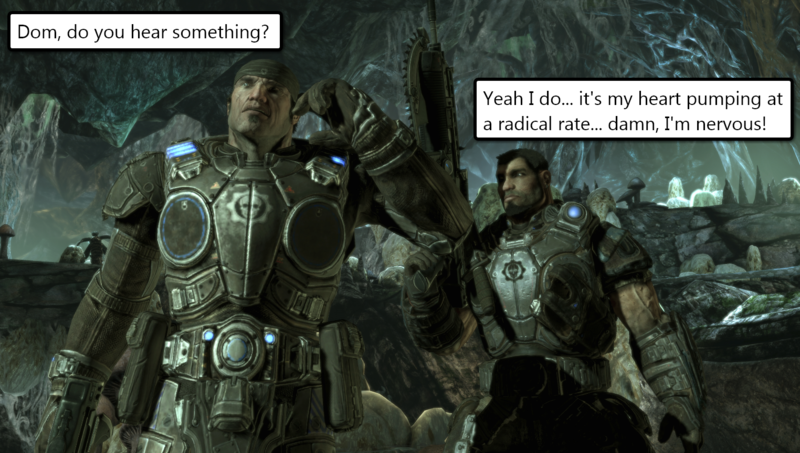 I'm thinking Gears of War 2 is an easy contender for "Game of the Year", yeah, that's about right. This Thursday at midnight cannot come soon enough cause I'm freakin' inching to get in there and beat the living hell outta them Locust and try my hands(have played it and it freakin' rocks!) at the new(and possibly the best) multiplayer gametype, Horde Mode.